I caused hilarity at Book Group last night when I confessed to something I did (accidentally) yesterday afternoon. One of my sons tends to linger in the car playing on his phone while I dash ahead into the house. I assumed that he’d follow me in eventually – especially as he often goes straight upstairs or into some quiet corner. I was pretty busy and got on with a couple of jobs then made the boys tea, but when I called him to come and eat, there was no reply. I was annoyed, then worried when he was nowhere to be found anywhere in the house. Suddenly I remembered that about ten minutes earlier I’d heard a car horn sound. I looked out of the window to see my son’s very annoyed face looking out of the car which was parked in the drive. He’d played his game till his phone ran out of charge, then realised I must have somehow locked him in the car, maybe by clicking on ‘lock’ on the key after I got in the house. He hadn’t been able to phone me, as he had no power on his phone, so he’d sounded the horn but I hadn’t realised it was him. I had no idea that some models of car mean somebody can be locked in so completely, with no obvious means of getting out. It used to be that you could release any locking of a car from the inside. So I’ve learned something about car locking mechanisms (be warned everyone, even a teenager can get locked in a car if you are absent minded enough), and my son’s learned to get in the house, fast. I was delighted to get the ‘fantastic mother’ award of the evening. We discussed ‘The Unlikely Pilgrimage of Harold Fry’ last night. We all loved it, and I now have a question from the entire book group to ask Rachel Joyce when me and my friend Clare go to her talk on Saturday morning at the Chipping Norton Literary Festival. The postman has just been. 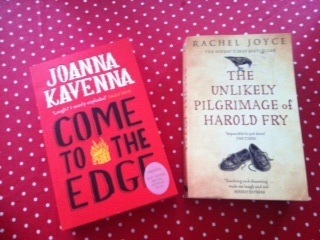 I’ve received my copy of ‘Come to the Edge’ by Joanna Kavenna, published by Quercus. I’m looking forward to reading it, especially as Kavenna has been voted Granta’s ‘Best Young British Novelist 2013’.